In the summer of 1980, one of the greatest tennis matches in the history of the game took place when two of the most accomplished players met in the Wimbledon final. In Borg McEnroe, Director Janus Metz brings the story of the two men to life in this beautifully crafted biopic and takes a look at the dynamic which existed between them on that fated fortnight. 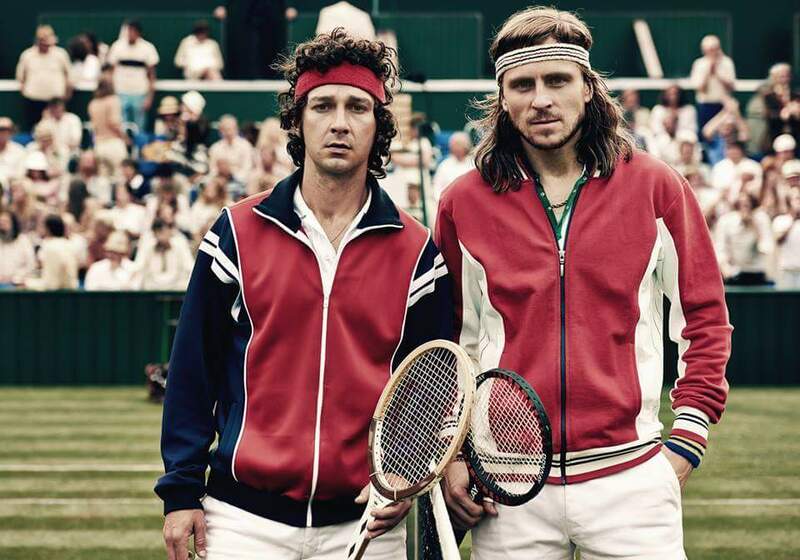 Staring Shia LaBeouf in the McEnroe role, and Sverrir Gudnason as the great Björn Borg, the film not only does a fantastic job in keeping the suspense going till the very end, but also manages to recreate the era almost perfectly, right down to the dodgy haircuts and questionable fashion sense. And it is even better if like yours truly, you had no idea who had won the infamous match all those years ago. Shia LaBeouf is John McEnroe, a loud brash young American tennis ace who after a great season arrived in Wimbledon with one mission in mind, dethrone Björn Borg no matter what it takes. Despised by the Wimbledon crowd and its empires alike, McEnroe spits, drops F bombs and even berates the audience for booing him for acting like a spoilt child. Determined to make people take him seriously, McEnroe has set his sight on the title and won’t rest until he meets number 1 player Borg and takes it away away from him. Borg (Gudnason), on the other hand, is feeling overwhelmed by fame, his imminent nuptials and a stressful losing streak which has been very demoralising for him and those closest to him, including his long suffering coach Lennart Bergelin played by legendary Swedish actor Stellan Skarsgård. Metz cleverly uses flashbacks to delve into the players’ formative years as teenage tennis ingenues in a bid to understand what makes them tick. Borg is presented to us as the quietly pensive ice king, supertitious to the point of pathology and meticulously organised, pitted against McEnroe who has been nicknamed the brat. Although presenting Borg as the more sympathetic figure of the two despite his isolationist nature, Janus Metz aided by Ronnie Sandahl’s impressive screenplay, offers a brilliantly complex character study of John McEnroe, a man dismissed by people as a bad loser, who would eventually become one if the best well known players of his generation. Shia LaBeouf is phenomenal in a role he was born to play. Capturing the essence of McEnroe in more ways imaginable, LaBeouf gives everything he can and then some, which in turns goes further into cementing his place as one of the best character actors of the last decade. Whilst sometimes lacking in verisimilitude, the film does a fantastic job in keeping its audience hooked till the very end, Sverrir Gudnason quiet yet determined portrayal of Borg is faultless as is the suspense he and LaBeouf manage to create around the story. A genuinely thrilling biopic, made even more riveting by its two leads who couldn’t be more different if they tried. A definite must see. Borg McEnroe is on general release from Friday 22nd of September.